Many of the team had recently clocked personal best performances over five and 10km, with most having had a superb winter over the mud of a cross country season. Warm spring sunshine was tempered by some strong March gusts, but such conditions proved no match for the in-form George Lowry, who placed 10th on the first long leg, posting a time of 23min 55sec for the 8k double lap of Birkenhead Park, after cutting it with the leaders on the first of the two laps. On the second leg for Morpeth was the mercurial Joe Armstrong, who looks to be transitioning from winter to summer in fantastic form following a 14:54 PB in the recent Armagh 5k road race. Armstrong produced a strong leg, elevating Morpeth from 10th to eighth on leg two – clocking 11:52 for the 4km short leg. Leg three (the second long leg) saw Andy Lawrence – currently in full marathon training ahead of London – enter the fray. Morpeth workhorse Lawrence consolidated the work of Armstrong and Lowry, by handing over to James Young in eighth place with a clocking of 24:48. A charging Young demonstrated his own stellar form, building on a recent PB of 14:41 over 5k in Armagh to hand over to Carl Avery in seventh position with a clocking of 11:38. Avery – very much Morpeth’s leading light – produced an absolute stonker of a performance to bring Morpeth home in third place on the third long leg. Avery’s clocking of 23:11 was second fastest of the leg behind Leeds’ Northern XC Champion, Emile Cairess. Morpeth were not only into the minor medal places, but chasing down Sheffield in second place. It was now the turn of Phil Winkler on leg six to continue the Morpeth charge, and the Leeds-based Northumbrian showed all of his pedigree by closing the gap on second place to a mere seven seconds with a clocking of 12:00. Morpeth were now perfectly poised to make an assault on the medals, and had the optimum firepower on leg seven (the fourth and final long leg) to launch the barrage on Sheffield in the form of veteran Ady Whitwam. Army captain Whitwam showed all of his courage in chasing down Sheffield, but was overtaken at the midway point on the leg by Liverpool’s Andy Rutherford. Whitwam’s clocking of 25:20, however, brought Morpeth to within just a minute of Liverpool. With the pendulum swinging in the opposite direction, Morpeth’s Taylor Glover (not long back from a lengthy injury lay-off), clocked a creditable 12:34 for the 4km distance on leg eight. Next on for Morpeth was Adam Pratt – who signed for the club in the January transfer window. Pratt’s clocking of 12:06 brought Morpeth back in fifth, just over 20 seconds behind Salford Harriers. Youngster Alex Brown reduced the gap to 19 seconds on leg 10, producing a blistering 11:49 for the single lap short leg. After a fantastic summer last year, this bodes well for Brown who should make significant gains of 5km and 10km on the road this summer. 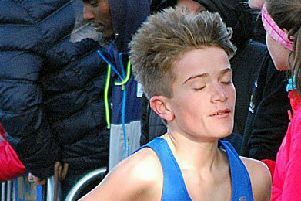 The ever-improving Tom Innes, drafted in at short notice on the Friday night, illustrated his Seniors pedigree as he showed tremendous spirit in consolidating fifth place for Morpeth Harriers on leg 11, with his clocking of 12:42 proving to be quicker than his leg at last year’s edition of the race. Innes handed over to Jordan Scott on last leg, who managed to clock 12:38 for the final leg of the day, the team finishing in a tied fourth place with Liverpool Harriers (whose final leg runner collapsed over the line with a hamstring injury) in a time of 3 hours 14 minutes 33 seconds. Collectively, Morpeth had produced their highest finish in the Northern Championships since their bronze medal-winning performance of 2016. Not only can the Morpeth team be well satisfied with their performance, but they can also be optimistic heading into the National 12-stage Championships at Birmingham on Saturday, April 6, with several of their top runners set to return. The race itself was won by National Cross Country winners Leeds City AC in a time of 3 hours 6 minutes and 43 seconds, nearly five minutes clear of their nearest rivals, City of Sheffield and Dearne AC. The earlier six-stage women’s relay, meanwhile, was won Rotherham Harriers and AC in a time of 1 hour 47 minutes and 40 seconds, just ahead of Leeds City.